Built during the second half of the 19th century, the church is one of the oldest and most important buildings in the area. Its story is linked with the historical evolution of Nikiti, the passions, the joys and the dramas of the people. It is reasonable to assume the Nikiti was named after Nikitas, its saint protector. However, this seems not to be true. The church was build in late 19th century while Nikiti was established several hundred years before in 14th century. In the meantime there was not a church devoted to St. Nikitas in the village. Therefore, it is very probable that people choose St. Nikitas (Agios Nikitas in Greek) as their protector inspired by the name of their village. Another hypothesis relates the origin of some of Nikiti inhabitants with St Nikita. There is an oral tradition which claims that the first residents of the place had come from the coastal settlements to the south of Nikiti. Moreover, in a location called “Nikitas” in Elia, south of Nikiti, there are the ruins of an old church and probably a Byzantine village. It is reasonable to assume that the saint protector of these people was Nikitas and that is why the toponym of the place has survived until today. So when there was a question of choosing a saint to devote the new church, people originating from the old village of Nikitas, managed to persuade the others to choose their beloved saint. 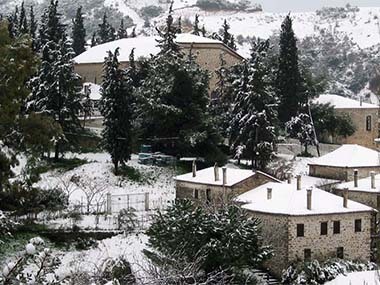 Nikiti established during the 14th century in the location of an old monastic estate. The monks had very probably built the first church in the area during the 14th century or even earlier. This church, which is located a few meters away from the church of Agios Nikitas, served as the main church of Nikiti for several centuries. It had been decorated with wonderful frescoes which sadly have been destroyed due to lack of basic conservation. One may observe only a few remains of the frescoes on the walls. In modern times the church was dedicated to the Virgin Mary Assumption. It is unknown to which saint it was dedicated in the past. This little church served the villagers for many years. However there was a need for a bigger church as the population grew. Of course, those years of the Ottoman rule were difficult in every respect. People were poor while the policy of the Turks for many years was not to allow the construction of new churches for the Christians. The conditions for the construction of a new church were ripe only towards the end of the Ottoman rule, the second half of the 19th century in particular. It seems that it was a period of economic and population growth in Nikiti. At the same time the political environment became more relaxing as the late Ottoman state attempts a series of liberal reforms in order to acquire a more European character. The erection of the temple had begun with the encouragement of the bishop of Cassandra to the people of Nikiti. To get the money required, a large pasture area in Nikiti was leased for five years to a family of Vlachs who used to bring their flocks in Halkidiki for the winter period. Further money contributions were made by people from other areas of Halkidiki. But despite the decision to erect a new church, there was disagreement over the exact position in which it was to be built. The residents were divided into two groups that wanted to build the church on two different sites, each of which was near the house of the leader of the respective group. Finally the group which wanted the church to be built at its current location prevailed. It is interesting to note that the site chosen to build the church was not previously the location of another church either Christian or ancient. In fact, according to tradition, the site chosen was the location of a tower which was used by Turkish soldiers who regularly camped in the village. It is likely that that tower had been built by the monks at the time that the area was still a monastic estate. In any case, the tower had been burned down a few years before the construction of the church and the Turks had moved, leaving the space free. The church was founded in 1867 as reported in plates that appear on the outside of the church. It should have operated a few years later during the decade of 1870. The church of St Nikitas came quickly at the center of the local social life. The size and grandeur of the temple reflected the economic and population expansion of Nikiti. Almost all social events were taking place in the church as the social and religious life are inextricably linked in the Greek countryside even to this day. The heyday of these events was the feast of St. Nikita whose memory is honoured by the Church on 15 September each year. The festival used to attracted pilgrims from all parts of Halkidiki. All residents attended the mass in the church and then celebrated in the village square meters below. Along with them was a host of merchants selling their merchandise. In modern times the importance of the festival has languished as a result of modern lifestyle. However in recent years attempts were made to revive the old customs in an effort to keep alive the traditions of the place. The Second World War was a difficult period for Halkidiki as in all country. Nevertheless not as difficult as the civil war that followed in 1946-49. In Halkidiki, like in most areas of Northern Greece there were battles between leftist guerrillas and government forces. The forced conscription that both sides applied, particularly the guerrillas, resulted that many peasants took part in the battles involuntarily. On the other hand the ideological conflicts and contradictions that existed in the small rural communities were often dramatically maximised during the civil war. Such a drama was played in October 1948 in Nikiti. There was a guerrilla battalion stationed in the area as from there, they were able to control the entrance to the peninsula of Sithonia. On the other hand there were local anti-guerrilla forces in the village. The area soon became a theatre of fighting between rival forces with several deaths on both sides. In an unfortunate twist of the battle, two locals were locked inside the church. From there, thinking that the guerrillas would not dare to enter the church they began shooting against their enemy positions. The guerrillas had incomplete information about the size of the threat and they decided to set fire to the church. The mission was taken over by a teenager and former shepherd, undoubtedly a victim of the compulsory recruitment system. He secretly approached the church at night and threw petrol all over it. The church took fire immediately blazing up into the icy night. As most of it was made of wood, it easily burned down. The two locals that were inside were burned alive or killed by the guerrillas while attempting to escape. There were blood prints of one of them on the floor of the church until a renovation of the 80’s. The church, a monument of traditional architecture which a dispute between residents endangered its construction, was finally destroyed as a result of another dispute, much more serious, that marked Greece and the local community for many years. After the fire only the stone walls were left and a picture of St. Nikitas which was miraculously saved. The people of Nikiti mourned the destruction of the temple, but they were determined to rebuild it in its old glory and grandeur. The reconstruction was done in record time from 1948 to 1950, especially if one considers the dismal economic situation of the time. Since then the church has undergone renovations to make it functional, the most recent of which is the construction of a new patio at the entrance of the temple, following the tradition of Mt. Athos, and the reconstruction of the stairs leading to the temple.